Many sports events will take place in the Citta’ dei Fiori in April. From Tuesday 3rd to Friday 6th April, the31st Campionato della P.G.A. Italiana, the championship for professional golfers, will take place at the Circolo Golf degli Ulivi di Sanremo. For the ones who love the seaside and the wind, from Friday 6th to Sunday 8th you will have the chance to see or partecipate to the 48th Criterium velico di Primavera. 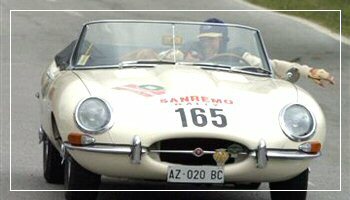 The Sanremo “Coppa dei Fiori” rally will be back FromThursday 12th to Saturday 14th April. All vehicles built until 1981 will be accepted and the deadline to apply is March 24th 2007. The competition will be divided in seven special trials in two laps, for a total of 320 km, all along the inland of Sanremo (Colle d’Oggia, Perinaldo, Langan, San Bartolomeo.) The start and fininshing point will be the Piazzale Carlo Dapport. The XIV Meeting Internazionale Mountain Bike Downhill (Monte Bignone /San Romolo), will run between April 22nd/23rd. Organised by the Argentina Bike it’s a great chance for everyone who loves mountain bike journeys close to nature in the Sanremo inland.